When a plant has “weed” as part of its name, it could cause a little bit of confusion. As a gardener, would you feel as you could really brag and be proud of a plant in the landscape that is called a weed? Well of course the answer is yes, especially if it is Joe pye weed (Eutrochium purpureum). Brag away! While Joe pye weed (Eutrochium purpureum) can be observed growing along roadsides, some have never taken in to consideration its outstanding ornamental characteristics. It is a large plant which needs space, but when planted in mass it can provide an eye-catching backdrop by providing some height in the garden. This herbaceous perennial is native to Ohio and grows in meadows and open woods with full sun to part shade in damp-to-dry moisture conditions. Joe pye weed typically grows 4 - 7’ tall with a spread of 2 – 4'. This plant has dark green leaves with toothed margins arranged in whorls of 3 - 4 leaves per node on thick green stems. 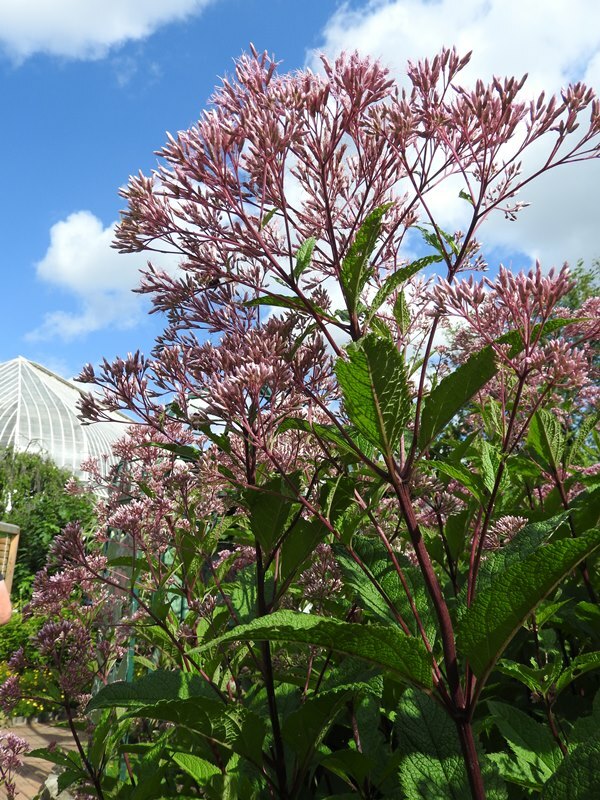 Joe pye weed blooms in mid-summer to early fall with tiny vanilla-scented pinkish-purple clusters of flowers. Seed heads will persist through the fall and into the winter, providing some seasonal interest. Joe pye weed's showy and fragrant flowers are very attractive to butterflies and bees and can be used in both formal and informal landscapes. So don’t let the name discourage you, and be proud of this native plant that just might have a special space in your garden.